It’s hard to explain the Twitter Trolls. I’m not sure how to explain something I can barely wrap my head around. I know this about the trolls, they are either monumentally stupid or completely amoral, I am sure of one thing: The common denominator in the unholy alliance between Toni Ingram and the Twitter trolls is a woman named Sarah Afshar. In December 2012 a blogger named Sarah Afshar interviewed Toni Ingram for a self published Yahoo Voices article . How Toni and Sarah found one another I cannot say. Maybe they crawled out from under the same rock. Don’t know, don’t care. Anyway, members of the Truth For Morgan group noted multiple mistakes in Sarah’s article which we detailed in the comment section of that article, Our observations were not appreciated. (comments have since been disabled). For later reference it is important to note that until Sarah’s article was published we had absolutely no idea who she was. Additionally, we had no prior knowledge of Sarah’s interview with Toni. We learned of the interview and resulting article when Toni linked to it on Morgan’s Stalking. It was shortly after Sarah posted her interview with Toni that it all hit the fan. Toni Ingram already hated TFM because we had the temerity to make the police reports available to the public. Readers of her blog might note that on occasion Toni vociferates about someone known only as “they” who wants to protect the killer and suppress the truth (Toni’s version of the truth). 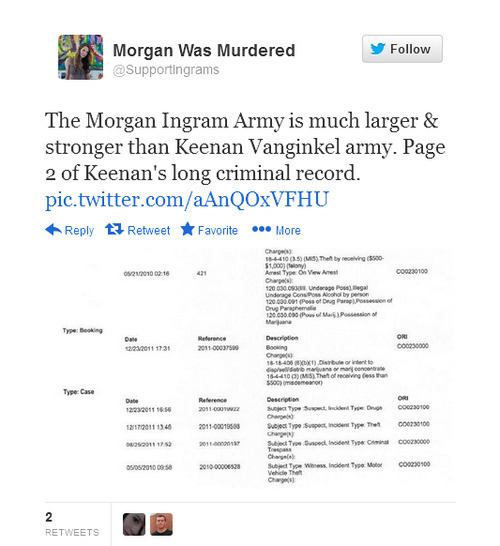 Truth for Morgan is “they.” Our crime was making the factual reports available online for all to see. That and knowing how to think for ourselves. By this time it probably occurred to Toni we were not going away. Toni turned to her new friend Sarah for help. Sarah is a talented young woman who is especially good at pretending to be a victim. She got busy and wrote a long piece for her blog in which she denied all the things we never said about her . It’s an eight paragraph pretentious fantasy speaking directly to Mayra Martinez in which good (Sarah) vanquishes evil (Mayra) because blah blah blah she’s already winning because Mayra is old. Poor Sarah. I’m not being facetious, I really do pity Sarah. She tries to sound sophisticated and wise, with confidence and brains to spare. She almost pulls it off but tries just a bit too hard and in the end comes across as conspicuous and just a bit pathetic.. I have no way of knowing whether or not Sarah was honest in in her litany of denials. Consequently, it’s only fair to give her the benefit of the doubt. However, I do not have to extend the same courtesy when it comes to her slander of Mayra because I know Mayra. Everything Sarah said about Mayra Martinez was a lie with two exceptions:. Mayra is fifty and she does live in Eugene Oregon. Everything else was a lie. Just when it seemed that it could not get any crazier, the trolls arrived. Again, I have to back up a bit. At some point in the past someone named Michael Coleman Odegard crossed paths with the wrong person. I don’t know the details and I don’t care to take the time to find them. All I know is, just as with Keenan Vanginkel, there are redundant poorly written blogs dedicated to vilifying someone and accusing him of being a stalker. Not surprisingly Michael Odegard, in a blog he put up to defend himself, says he knows Sarah Afshar and met her ten years ago in her msn chat room. Odegard also claims to know Brian Mann also having met him in Sarah’s msn chat room. Brian Mann claims to be a victim of Odegard. Brian and especially his alleged brother Mark Mann are actively engaged in cyber stalking the Vanginkel family, Mayra Martinez and an ever growing list of others having the misfortune to appear on their radar. I want to post screen caps of some of the troll’s vile tweets so readers know the kind of bile they regurgitate on a daily basis. I said in the first paragraph that the trolls are either stupid or amoral. If they actually believe Keenan Vanginkel did what they accuse him of doing, and base that belief on what Toni Ingram said, without fact checking her on their own, they’re stupid If they are taking money, as some allege, to ruin lives, inflict pain, and optimize anti-Keenan phrases in Google, they are amoral. It’s likely we’ll never know for sure. What we do know is regardless of their motivation, Steven and Toni Ingram approve of their behavior. The Ingrams, say their daughter was viciously gang stalked and murdered yet support and endorse a group of cyber stalkers. I am just dumbstruck that neither of Morgan’s siblings nor her friends have stood up to Steve and Toni and said enough of this hypocrisy. There is NO EVIDENCE against any of the accused. The Ingrams defile their daughter’s legacy with their campaign of misplaced vengeance. Their actions make Morgan’s heartbreaking death that much more unbearable.